Aalayam - Colors, Cuisines and Cultures Inspired! 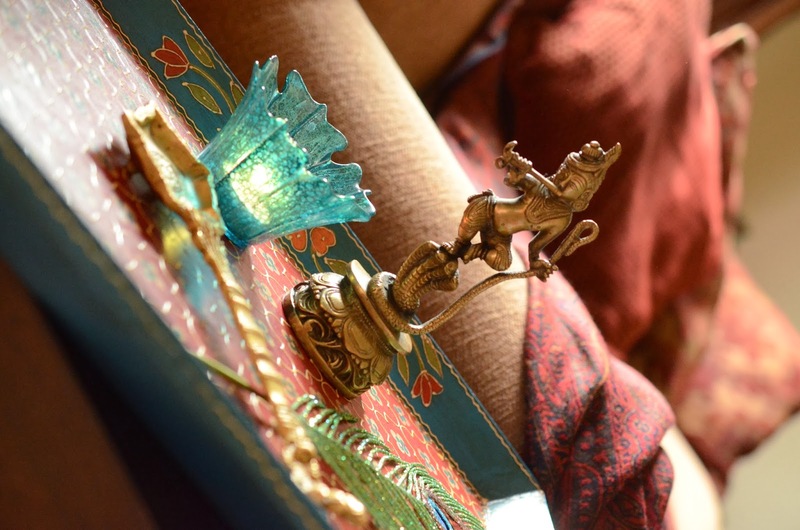 : Diwali home decor inspirations - An Aalayam special! Diwali home decor inspirations - An Aalayam special! Deepavali begins with a row of lights - add some color and a festive signage! The festival of lights is around the corner and many Indian homes will soon be bathed in the tepid glow of flickering lights metaphorically representing the essence of Diwali. As I started gearing up for my favorite festival, I paused and let my mind wander and reflect. We are in the thick of the Hindu festive season and soon we shall be heading towards the Holiday season, here in the West - Thanksgiving and Christmas. I see it as a great privilege to be able to experience both these rich cultures. I mulled over a single question " What am I celebrating?" and this triggered a cascade of thoughts and a wave of emotions, primarily of gratitude. I was overcome with a sense of appreciation for everything life has bestowed upon me. This Diwali, as we herald the Hindu New Year, I want to shine the spotlight on the notion of "SEVA" and social responsibility that is central to Hinduism. 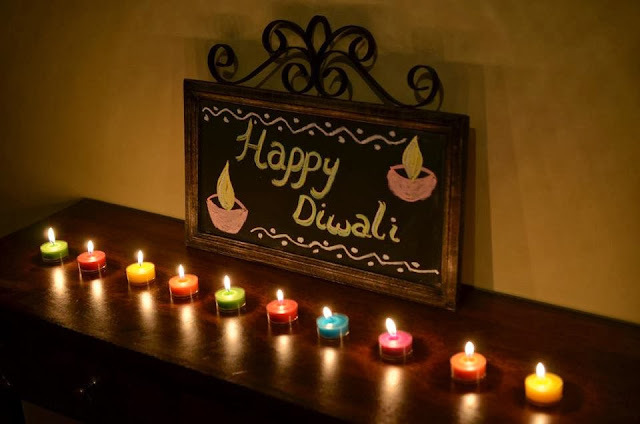 After all, it is the little altruistic efforts that spread the light and save the world from its darkness and what better time than Diwali to talk about helping those who are less fortunate. So, dear Aalayam readers let us start a conversation about giving back to the community. From personal fulfillment to a sense of connectedness to the community - giving back implies different things for all of us. What does it mean to you? Do you like to volunteer your time, help the elderly, champion for environmental issues, plant trees or adopt pets? Please write to us about social causes that you are passionate about and Supriya and I will be glad to moderate this conversation, right here on Aalayam. And now - a creative tribute to the spirit of Diwali! I love Diwali for its symbolism and gaiety. Here is an excerpt from my Diwali post last year which echoes my sentiment about the festival - " Mom always celebrated Deepavali with much oomph! Cleaning, cooking, shopping, decorating, religious worshipping - she went the whole nine yards, always! And so, with much fondness, I brought a montage of memories of firecrackers, clay oil lamps, new clothes, visiting relatives, home made sweets and my parents’ unique Diwali traditions to my married home and over the years I have created a tailored array of rituals to suit my own family.Decorating my home for Diwali is a huge part of that tradition. A round or two of autumnal cleaning usually precedes the decorating. 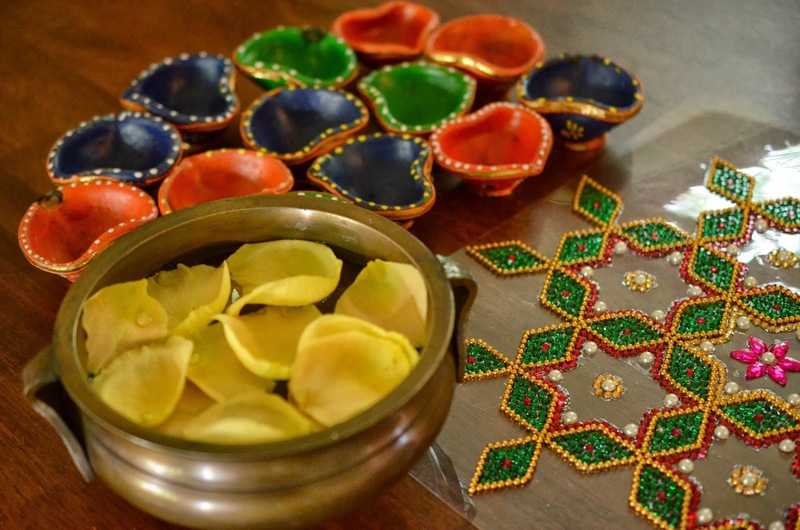 Rummaging through boxes of stored away Diwali décor items often yields re-usable items. A few new items are added each year but the design is always built around the core elements– lights, flowers, rangoli and thorans. I am very tradition-centric. For me the focus rests on light, divine blessings and good-will." And so, with a little effort I try and make this a memorable annual occasion for our family. I am thinking brass, flowers, color and of course lots of tea lights for my inspiration board - how about you? In this post, I bring to you seasonal decor and tips from around my house to help you get into the mood of the season - join in! Find of the season - copper toned tea lights from Hobby Lobby! 1) A little planning goes a long way - no really, it does! I tackle life with the age old to-do list. There is no greater joy than striking off things on my to-do list. My Diwali planning was no different, it began with the inescapable to-do list. Notice also my tea light holder from Hobby Lobby. I am calling it the "find of the season". The gleaming copper finish is a perfect little way to add sparkle to your Diwali decorscape! Use what you have - brass accents for a festive touch! 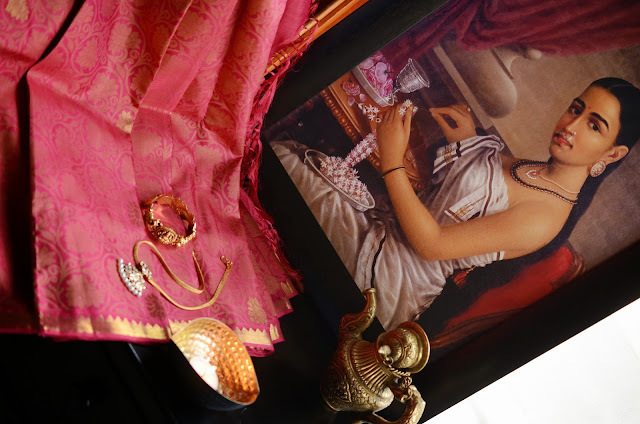 2) Incorporate heirlooms - why not personalize your festive decorations with a treasured heirloom? Start with what you have. I am sure with a little combing, you can always find things around the house that can be incorporated My Panchaloha Vishwaroopa originally belonged to my mother-in-law. Paired with a few floating mums in an urli, it makes an eye catching festive display in our home! 3) Color is key! If you are an Aalayam follower then you know that color is our dominant decor mantra and I am saying it again this Diwali. 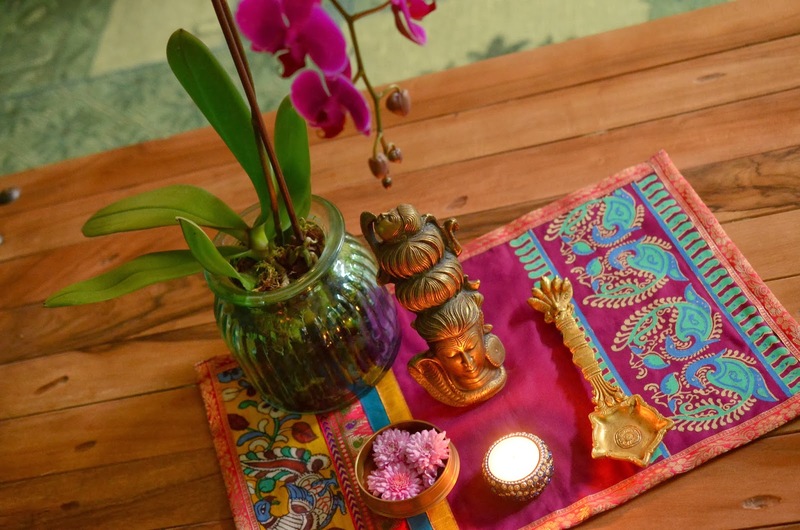 This variegated table mat adds depth, dimension and an ethnic touch to my accent table Diwali vignette. I chose brass as the core element this season to help me make a statement and stay within budget! 4) Build around a theme or not! Really, decorating is all about letting your creative visions come to life . So, have fun or if you are like me -short on time, then pick one core element and build around it. Huge time saver! My treasured brass pieces have been lovingly used in the various vignettes around the house this year. Flowers and colors make the perfect companion accessories - it's Diwali and you can tell! 5) Quirky accents add interest - Why not pair traditional brass accents with a few off the wall accents for a unique creative rendition? The peacock feather adds an element of whimsy, don't you think? 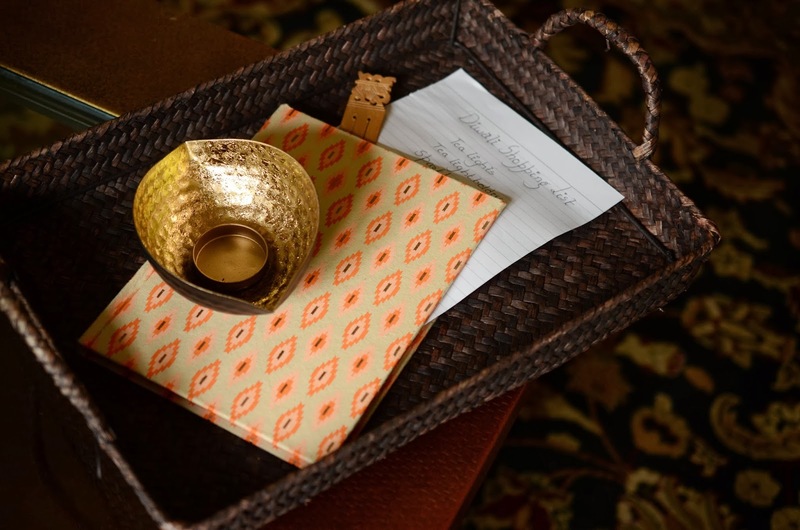 I have also included a wooden tray and an etched glass votive holder in complimentary colors for added punch. 6) Pay attention to details. Our home is a collection of ethnic accoutrements - pieces lovingly collected over the years. This stone Krishna is a testament to exemplary artistry. Look at the etched details on the garlands and the braid - it is the brilliant handiwork of an artist somewhere in Mahabalipuram, India. Diwali is the perfect time to pay a tribute to such craftsmanship. 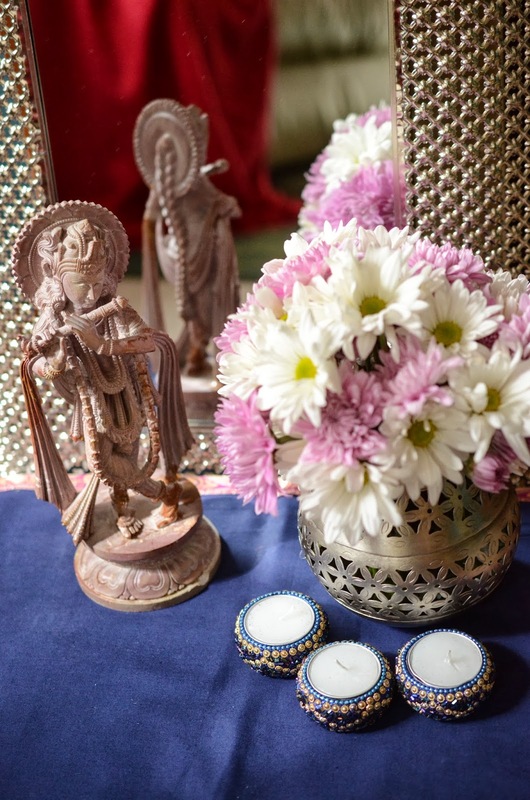 This vignette was styled by my friend, Lakshmi. She was an enthusiastic accomplice and helped me put together a couple of the vignettes. Looking at this,would you be able to tell she is a Neurologist by profession? Brain circuitry and creative expression - a unique mix of interests, don't you think? Well, that's my friend Lakshmi for you! 7) Art meets life - in this exclusive Diwali rendition, Lakshmi captures the ritualistic more of wearing new clothes for Diwali. My addigai (pendant) paired with Raja Ravi Varma's Kerala girl also wearing an addigai makes an interesting art meets life portraiture. So, what are you wearing this Diwali? 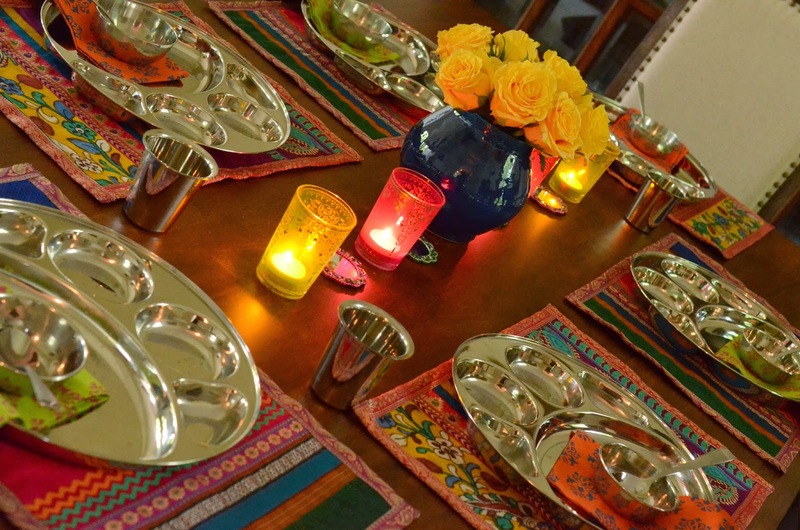 A thali dinner awaits my dinner guests! Thali tablescape from my home. Now, for those of you who are hosting parties and entertaining guests for a Diwali dinner - we have you covered as well! While I work on putting together our favorite family recipes together, I will leave you with a few snap shots of my tablescape. colorful accessories for a festive tablescape! 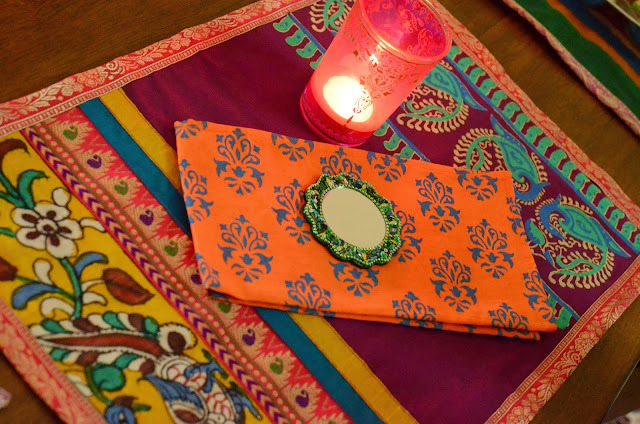 I custom ordered my table linens from Supriya's friend on a recent trip to India. Impressed with her work I commissioned her to create my custom festive table linens and I was thrilled with the end products. 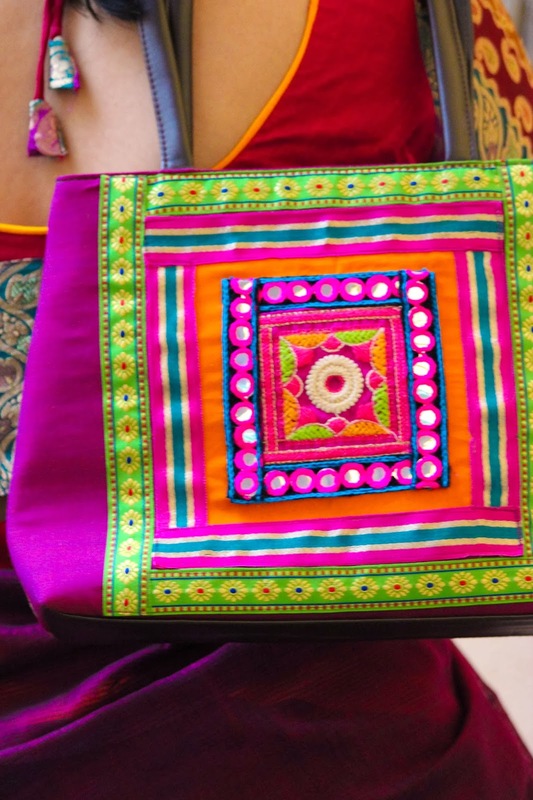 Ethnic colors, patterns and textiles blended to perfection! I have used the same mats in some of vignettes above and I love the native flare that these mats impart. Kalamkari and block print come to life in this one of kind table mat! Supriya will feature the artist and creative genius behind the brand Varnangall (Lavanyaa) in our next post. Her products are the amalgamation of passion, artistry and ethnic identity and you don't want to miss our next two posts. In collaboration with Varnangall, Aalayam will be giving a gorgeous Varnangall product away and here is a sneak peek into what we are giving away! So, make sure to tune in for more details about the giveaway! Dear readers, I wish you all health, happiness, prosperity and peace this Diwali. I had a lot of fun styling these vignettes and I hope this will inspire you to kick your decorations up a notch this year! Take a stab and I promise you will enjoy it! P.S: All the images in this post (barring the last one) are from my home and are copyrighted to Aalayam. Please ask before using. Every time I visit your blog I know I'm in for a visual treat.....love the rich hues; Delightfully traditional yet easy to put together decor ideas. Thoroughly Enjoyed the post. Wishing Supriya and you a wonderful and sparkling Diwali !!!! Likewise Shruthi! Yup, these were incredibly easy to put together . I am eternally short on time :) and therefore, I need 5 minute decor ideas and that's how these came about.Little vignettes around the house to make the house come alive with the festive spirit! Deepa: What a colorful post. Your tablescape and the fresh flowers were a treat to the eyes on a rainy morning. Thanks L! 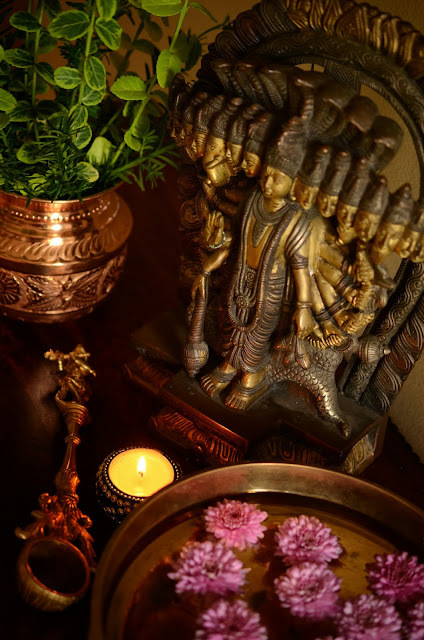 It is a pleasure to share these inspirations - you google holiday decor and it pulls up several 1000 images/links but google diwali and it pulls up a handful - so it is a privilege to add to the body of ehtnic Indian decor images. I am glad you liked what you saw! Really enjoyed this post Deepa... got lots of inspiration for the festive season... thanks! Thanks shalini! looking forward to be inspired fellow bloggers - will stop by! Love the post. Lots of ideas and inspirations for me this Diwali. Thank you. Wishing you and Supriya a very Happy Diwali. Thanks supriya for your feedback and I am humbled that you find them resourceful. Wishing you a very happy diwali as well! 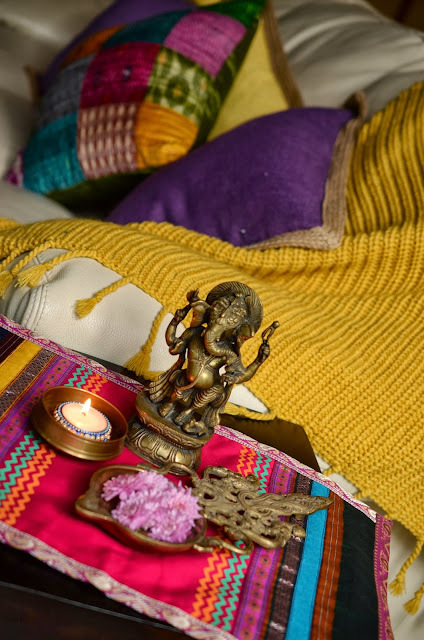 Nayana: This tealight holder was the only thing that caught my eye this season. Well, there was another one on overstock by NOVICA but that was too pricey. 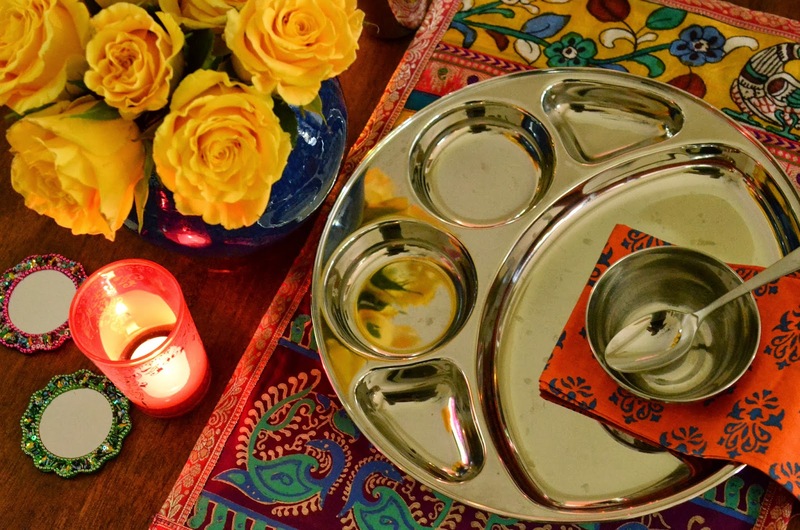 Thank you - the thalis are a new addition to my dinnerware and I love it. Do come back for our giveaway soon! What an absolutely gorgeous and brilliant post. Love the color and the decor. Happy Diwali. Thanks Anu and it means much coming from some one with a keen eye for aesthetics! Happy Diwali to you too! Such a lovely collection of ideas Deepa. Loved all of them. Nidhi: Diwali is such a special time of the year and so, putting in a little extra effort to bring some beautiful inspirations to Aalayam readers was a privilege. Please join the Aalayam family, we love welcoming new members! Disha : Thank you. I read your diwali post too and tried to comment - not sure if it went through. I love the synergy that we bloggers share - i think it creates more value for our readers. More inspirations, more eye-candy - don't you think? Happy diwali and thanks for commenting! Thank you Radha. Please join the Aalayam family. We have an exciting line-up for Thanksgiving and then christmas - of course! Shefali ! Welcome to Aalayam. Stop by and browse through our archives - i am sure you will like what you see :) and bring some friends too! We have a giveaway coming up shortly - stay tuned! A very happy Diwali to you Deepa and Supriya! Love all the pictures and the tableaus. Love those tablemats. Who does them here in India? Sujatha : Welcome to the Aalayam family! Thank you. Aren't they the most gorgeous tablemats ever? I custom ordered them from a boutique entrepreneur - Supriya's friend- lavanyaa . She owns the brand Varnangall. Stay tuned - we are featuring her and her gorgeous gorgeous line of products next along with a giveaway for a lucky winner!! I loved the post and the table mats. Thank you panchendriya. happy diwali to you too. i know, the mats are heavenly- you'll get to meet the creator soon. Beautiful post, Deepa. I was thinking of brass too, this year. I don't have very many brass things, but what I have will be out. Also, am planning to buy brass diyas every year from now on. Eventually I hope to have a decent collection. Thank you sue! you could group all the brass items you have and arrange them as one vignette or a center priece maybe on your dining table but use books or wooden platforms and vary the height of the objects for interest, throw in some fresh flowers and a few diyas and you have a very merry diwali! I want them brass diyas too - saw some at an exhibition when i was in India. How do I bring them back? heavy heavy! Thank you calindgirl! A very happy diwali to you. It's nice to see this post being so well received. Stay with us - the celebration has only just begun. there's thanksgiving , christmas and so much more to talk about. I'm not sure how I got here, but I'm so glad I did! 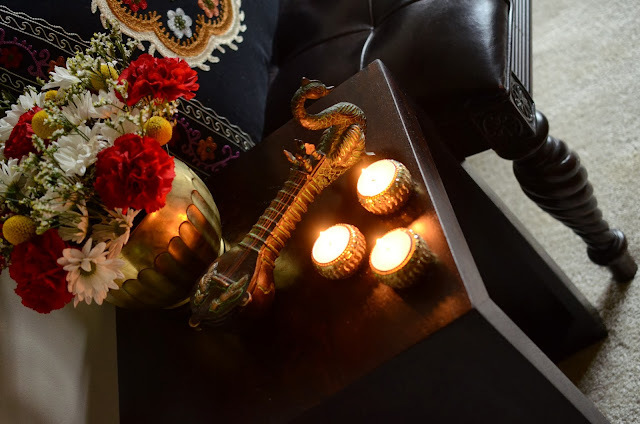 Your blog is such a visual treat, and this post in particular has given me a lot of ideas for adding a festive touch to my home this Diwali. Thank you! Hi there TBC.... and we're glad too that you serendipitously landed on our page! Hope you have a fun and beautiful diwali! we are hosting a giveaway next - make sure to participate! Shalini : Welcome to Aalayam. These are easy, five minute decor ideas to transform corners of your home and give it a festive up do. Hope you have fun decorating! Yup, I am in love with these mats too. Supriya's friend and I put a lot of thought into what we wanted these mats to look like and they truned out exactly as I envisioned it .. stay tuned, we are featuring Lavanyaa next. Happy Diwali Deepa!! Love your pictures!! Chaitra: Thank you! Its nice to see that our endeavors at curating creative inspiration is being so well received. We enjoy having this platform to bring forth lifestyle inspirations and it is great to have an interactive audience like you. Thanks for the feedback. Deepa madam your blog contains treasures of information on indian heritage and culture which is similar interest of mine. Deepa madam a nice blog with very valuable information and nice pictures. Deepa madam best wishes for your new arts and crafts projects. Deepa madam this my Diwali message "Lamps of India" which i shared in my Heritage of India blog. Deepa madam please look into my Lamps of India message and share your comments. Deepa madam today i joined as a member to your treasure blog. Deepa madam i hope you are joining as a member to my Heritage of India blog.